The collection’s penultimate poem returns to the ‘kesh’ and ‘loaning’ of Heaney’s Ulster landscape. A short poem of both celebration and relief published in the New York Times of December 31st, 2005. Writing poetry is complex; ‘vers donnés’, lines with poetic charge, are not automatic. If, as has been suggested Heaney was re-discovering his voice after a lean period of writer’s block it is interesting to recall that when his first collection of 1965 was under discussion with Faber he was urged to compose poems about what he knew. Heaney reverts to his cherished birth- place environment. Paradoxically, autumn, traditionally described as the ‘back-end’ of the annual cycle, represents rebirth (recovered speech), a sense of poetic composition coming naturally (having its way again) and generates involuntary delight in the poet: I gave a cry. 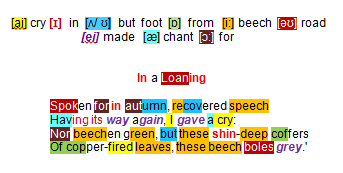 By painting as exactly as he can the subtlety of autumnal colour (not beechen green, but … copper-fired), injecting the restrained but tangible emotions generated by a cherished natural treasure-house of leaf-fall (shin-deep coffers) and using a language at once dialectal and archaic (loaning … beechen green … beech boles grey), Heaney’s final couplet confirms that there is lyrical life left in the old dog yet.